Who doesn’t love to go for a dip on a hot summer day? It’s why thousands of people flock to their boats, cabins, and beach chairs every weekend during the hot months. Because you probably bring along an icy beverage too, it’s all too easy to combine drinking and swimming. We all know that drinking and driving don’t mix, but you might not have known that drinking and swimming can be lethal too. Just like alcohol has the power to make you feel falsely confident behind the wheel of a car, it can also make you take risks while in the water. That may have been what happened when a 65-year-old woman fell into the water of Dana Point Harbor in California. Her husband said that they had some drinks and she fell in around 12:30 am. The dock was dark when she fell in, and although her husband jumped in after her and managed to pull her head above the water, she died shortly after when CPR attempts failed. It hasn’t been 100% determined that alcohol was the cause of her death, but according to a study in the journal Injury Prevention, it’s becoming common for alcohol to be a significant factor in drowning deaths. After compiling data from a host of studies, researchers found alcohol contributes to an estimated 10 to 30% of all recreational drowning deaths. Why is drinking alcohol so dangerous before you swim? Alcohol can impair your senses, alter your sense of distance, and make you feel disoriented and confused while in the water. Alcohol can also cause your body temperature to become lower than normal, so if the water is cold you’re much more likely to suffer from hypothermia. It sounds scary, but it’s easy to stay safe when playing in the water this summer. If you plan on swimming, don’t drink before you go in. If you do drink, stay out of the water for at least an hour per drink you consume. 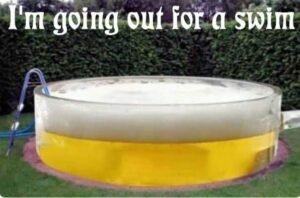 That way you have more than enough time to sober up before you take a dip.